FALSE PICTURES: Looming reforms have led to increasing calls for FNPF to change its logo and 'we care' advertising. Further to my earlier emails concerning FNPF pension reforms I refer you to the newspaper advertisement placed in the Fiji Times on 16 July 2011. This has inaccuracies and simply causes further confusion that leads to further questions being asked on just what FNPF is deciding with these reforms and is the very cause of undermining, misinterpreting and spreading of false information that you are so vigorously objecting to. These are just some points that need mentioning. There are many others that I will raise in later emails. It is gratifying to read that 9,627 pensioners are not going to have their pension reduced. This is the good news. The bad news is there are 1,209 pensioners who are going to have their pensions reduced. And the ugly news is you won’t tell us 1209 pensioners what you intend to do, and the sad news is, you seemingly just don’t care. I note in the second paragraph the advertisement states "there are few individuals with self-interest etc etc". Let me state quite categorically I am one of those persons who has a self-interest. I also suggest there are another 1,208 pensioners out there with that same self-interest. Let me put it to you this way. So far the various pronouncements made by FNPF indicate my pension is going to be reduced to 9% (or 36% of what it currently is). (According to your advertisement it may be to 8.7% which causes further confusion). With this anticipated reduction of 64% in my pension, that it seems will be effective in September 2011, don't you think I have a right to be worried and to protect my own self-interest. Let’s put it another way. If when you go to work tomorrow your employer says your salary package is being reduced by 64%, what would you do? Would you just meekly say "thanks boss that is fine" and walk away. Of course not you have a contact to rely on and would do all you could to enforce your contract and to protect your own self-interest. Just to check I am right, try this tomorrow morning advising Mr Taito, CEO of the FNPF and all management and staff of FNPF that their salary packages are being reduced by 64%, and see what reaction you get. I'll bet they don’t just say “ thanks Boss, that is fine" and meekly walk away. You would have a huge argument on your hands, probably a walk out, the union would get involved and quite rightly so, as Mr Taito and all management and staff have a contract of employment and would demand FNPF stick by it, in order to protect their own self-interests, and so they should, just as you would demand your employer stick by the terms of his contract with you. Is this any different to what you are doing to pensioners and their pensions? Do I make my point? We are merely trying to protect our own “self-interest”. Nothing more, nothing less. And when I say “we”, we are the other 1,209 pensioners who according to your advertisement are going to have their pensions reduced, by how much, who knows? And it seems if you know you won’t tell us! And this is despite the fact we have a binding contract with FNPF to pay our pensions that you and your associates seem quite impervious to, and with apparently no knowledge or understanding of the immense consequences and damage you are doing to our society and economy and our confidence in the law, as many of our daily needs are governed by contracts and FNPF. More particularly it is apparent you have no concern or care for 1209 pensioners who are going to be directly affected by your action. Across society and throughout commerce people can now ask , we have a contract, you said you were going to do it, but will you? It didn’t worry FNPF when they dumped 1209 pensioner’s contracts, so we don’t need to honour contracts any more. If it was good enough for FNPF not to honour pensioners contracts, it is good enough for us too! Imagine the chaos in commerce and society this could bring. Pensioners are not undermining, misinterpreting and causing false rumours as your advertisement claims. It is the lack of accurate, precise and factual information emanating from FNPF that is causing this problem. 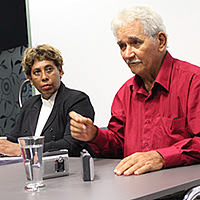 Pensioners have had to continually ask questions to find out and clarify precisely what the FNPF is recommending in its reform. Thus the many questions that largely remain unanswered. Other pensioners and I have questioned FNPF on the various statements that FNPF has made. This has been necessary because many announcement made by FNPF have not stood up to scrutiny. They have simply created uncertainty, and then more uncertainty by their lack of consistency. As an example, in the public meetings your speakers said “pensions” will be reduced because FNPF cannot afford to continue to pay pensions at these current levels. Then miracle of miracles we now find that 89% will not be reduced, and it seems FNPF can now afford to pay these 9,627 pensions when previously FNPF said it could not afford to continue paying pensions at current levels. Do you wonder why there is confusion? You have brought it upon yourselves? We wonder do you really know what you are saying and doing when we see such wide contradictions in the information you are providing? Had FNPF been transparent in its deliberations, and given pensioners accurate and correct information, and allowed them to contribute in a meaningful way to the reforms, then you and your associates could perhaps have avoided the predicament you now find yourselves in. You cannot even acknowledge publicly that pensioners have legal and binding contracts with FNPF to pay their pensions, or that there is a Government guarantee in place to support FNPF that you and your associates seem incapable of calling up. Your statement in the Fiji Times of 23 July is further evidence of this inconsistency and just causes further problems one of which I discuss below. It is gratifying that FNPF has finally confirmed 9,627 pensioners who receive a pension below $800 will not have their pension cut. What may I ask is to happen to the other 1,209 pensioners on that list. Are they all to have their pensions cut to 36% of their existing pension? Or is it 8.7% of their original balance? You see what you are suggesting is quite unclear! Does this mean that a pensioner on $2,000 a year will get a cut of 64% and his new pension will be $680, or $120 below the poverty line. If so how do you explain that you and your associates are comfortable with this when you have deliberately reduced these pensions to below the poverty line. How do you expect these pensioners to survive? Is this the best FNPF can do? Does this mean that a pensioner on a pension of say $801 a year will get a cut of 64% and his new pension will be $272 a year, or $528 below the poverty line? Whatever cut he gets, he will be below the poverty line. Surely you are joking as the pensioner who was getting $800 has no change, and the one getting $801 is to be reduced to $272? You cannot be serious? Have you done your arithmetic? Don’t you see the inequity of all this? How do you explain that FNPF is comfortable that 9,627 pensioners, are to be paid 100% of their pensions and yet the remaining 1209 pensioners who receive pensions of above $801 are all to have their pensions cut by it seems 64%. Surely someone is being subsidized? How do you balance this out, as all of your pronouncements indicate subsidies are the very basis of your concerns? These questions are simply to clarify the issues you and your associates have raised in acting as prosecutor, judge and jury on pension reforms and are not to undermine, misinterpret and create false rumours. There are many other questions that will be asked in later emails. It seems you are deliberately targeting those 1209 pensioners who receive a pension of $801 or more. Some would call this blatant discrimination! You and your associates are in a mine-field of your own making! In the question and answer panel at the foot of the advertisement you ask at question number 5, “Has the Fund considered that the review of the current pension is not legal and fair as both confidence and contract issues are compromised?”. You then proceed to answer an entirely different question that has nothing to do with confidence, contracts, or the Law of Contracts. Would you please now at least do the right thing and stop treating the reading public and your pensioners as simpletons and give a direct answer to the question you posed? As I said in my letter of 9 June 2011 to Mr Taito, to which I have never received a reply, pensioners have an irrevocable contract with FNPF to pay their pension. This is a contract that cannot be voided or changed. Remember these 1209 pensioners are the very same people who simply followed the law for some forty years or so, who did what was required of them as good citizens and paid their contributions to FNPF, and trusted implicitly in the law that they would be protected and be provided for as the law demanded. Sadly this law is being high jacked by you and your associates in your shameful attempt to make it redundant. At least we would then have known you and your associates have some care and concern for your pensioners. Can I suggest you immediately change this to a more appropriate..…” Destroying our 1209 pensioner’s future”, or if this is too long just “Destroying your future” sounds good, as you and your associates are doing a good job of it! Editor's Note: David Burness' case has been delayed with the High Court in Fiji asking him and his lawyer, Shaista Shameem, to amend their application according to High Court rules. Seventy-five-year-old Burness' case is based on a redress of human rights. He has also been asked to provide details of how the planned FNPF changes will affect his rights. Who is the puppet master kaiyum to revoke the law that exists for FNPF and workers of the nation, who is this man and his cronies on FNPF board, who appointed them by an election, who gave them the mandate and power and who agree with them. The answer is no one. The chairman of FNPF is a Sri Lankan stooge and not even fijian. Kaiyum is not elected and will never even win an election seat even if he stand in any any seat in the country. No right to cut the pension by 64%, this is dictatorship and forget the dictator who is no school just hand puppet. The unions and workers and people of fiji must stand up and fight this evil of the junta of thugs and kick them out. A future government must restore the pension to what is now and reverese the tryants decrees of oppression of the people of fiji. FNFP pension is binding law, irrecovrable contract and government gaurantees and FNPF has all the monies in its balalce sheet and can call on the junta to pay the pension and no cut. this is injustice and abuse of power by guns and these mad thugs. Workers must fight PER or PER this pension must not be cut but the junta of thugs kicked out. This not any body fathers monies but workers rights and monies. Junta paying 700000 by aunty firm to kaiyum and dictator and want to cut 65% fnfpf pension is not justice. power to the workers and people. Out with the people charter bull and in with people power. Good on you Ross! Its about time, we the 1209 pensioners stand up, and make our views heard! Not only the 1209, but all pensioners, if not today, then tomorrow, but we all will be affected! There is a contract between FNPF and pensioners, and if FNPF is not willing to fullfil it, then we have every right to fight it. Killing former comrades - stealing from the people - beating woman - now stealing from pensioners - welcome to Vore's new Fiji. I would love to know exactly how much R G McDonald had as his FNPF balance and how much has he taken out? Why should other younger FNPF members sudidise him?? With RBF reported infaltion rate of 10.8% as at june 2011 and with 64% reduction in FNPF pension rates all these pensioners better find a spot quickly on SUVA streets to beg themselves to survive. Is this what this junta of thugs want????? Who gave them power to decide the cut of 64% in pension rates, its workers monies and not junta's fathers monies, hands off this cut. This junta is in existence only becasue of the guns it uses to stay in power and media censorship and PER. Remove these and then see the people of fijis power. It's pathetic, though I sympathise with them, that none of these Pensioners were vocal about the Regime taking over Government, from the outset. Blind Freddy could have seen what was coming from December the 5th. 2006. It's too late to start complaining about something which should have been opposed from the beginning. Thisis the problem when the illegal regime puts dummies like Aisake Taito & Kodagoda in areas beyond their intellect. Taito can't even prove his worth when hewas with Ministy of Finance. He aided and encouraged two FNPF former staff who have deserted the fund to trump/cook up cases against former CEO Olota & his senior management team so he could get the job. Now we have a crank Chairman who knows nothing about FNPF telling the people of Fiji how their super fund should be run. You see the coup has given us Fiji the opportunity to really see the kana loto and daylight robbery of high office. the same in othr gvt ministries and statutory org's - its bee lead by 5 tier leaders - Fiji is in a mess. Again I say, haul in Lionel Yee and get him to explain how these high rates of pension were going to be paid and from where was the money coming from? Looking at David Burgess's picture and that hypocrite sitting next to him makes me laugh. Here are two people who way back in 2006/07 were the biggest supporters of the current illegal regime. Little, due to their self egoistic stupidity and arrogance attitude and no care for the law abiding and God fearing people of Fiji, did they realise that the tyrant they supported and fell in love with at that time will turn around and say, okay I've stuffed up so I'll dip into your pockets". Now they are crying like babies and are trying to fool the people that they're doing this based on their human rights. Haaaaaaa....what about the human rights of the poor ladies and men who were tortured and came to for assistance and you said to them they deserved the punishment 'cause they started it? It is now your turn to taste your own medicine 'cause your started it. Mongorel arrogant bastards!! What you expect from new FNPF Board and management who have no experience in superannuation and provident fund matters looking after your financial future? I am member of FNPF who is very concerned that FNPF has not come up with a single one major investment since 2006 to improve the investment returns for its member and a sustainable fund. All I hear are FNPF excuses why the pension should be reduced and pointing fingers at others for their faults. Now we have a prime minister who was at the end of the class in high school and the only option was to join the navy. Now this PM who is a loser is supposed to look after your needs as a citizen and the secure the future of the country. This gives us a lot of confidence! NOT! All I hear from the illegal PM on his personal dislikes of others and how to detain them at the camp….and saving their own behinds. Once again, what do we expect from these cronies and their friends who are appointed by the illegal government? ASK/BAI WILL PUT FNPF DOWN. Time for fiji people to stand up/fight enough talk. THe former advisor and head of human rights abuse will not win this battle because of pranic healing practiced by the FNPF Directors. We need Pranic healing to win this Battle. Please Enrol for Pranic Healing by contacting Sashi Singh FNPF Director at CDP Office at Walu Bay Suva. Bainivuaka and Bainiass should also enroll for the above course to fix our economy and have 2014elections rigged. Vinaka Ross pls fight for the people money . FNPF money is the the members not ASK/BAI f up govt. They have used 2 billion for f govt .so no money to give to the members in the future. lets boycott CJ Patel businesses and its products. Kokoda is the Financial Controller of CJ Patel. lets boycott CDP services and CJ Patel linked business. Can someone provide us a list of all CJ Distributor list. Also we need to make a comprehensive list of all business that support this illegal regime. Include their products and services that we pensioners can boycott. Ajit Godagoda and Seshi Singh are directors of FNPF and we need to hit their business hard. They are not members of FNPF and they dont care about 0ur pension funds.